A friend and I were talking the other day about foods that are must-haves for every vegan. Quinoa and kale came up, of course, but in my opinion, no vegan pantry is complete without hummus. Preferably homemade hummus. With lots of garlic. When I first started making my own hummus, I relied on the Traditional Hummus recipe in The 30-Minute Vegan. 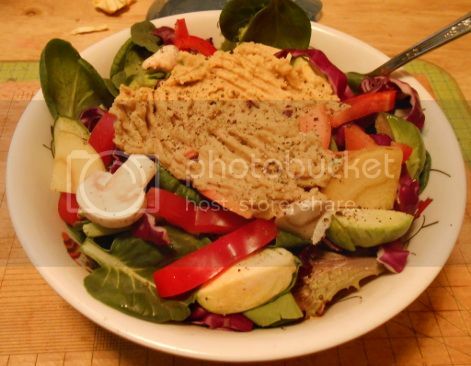 It’s a good basic recipe with all the standard hummus fare like chickpeas, tahini and lemon juice. However, it only calls for two cloves of garlic. Two cloves? If you’re like me and enjoy a really garlicky hummus, two cloves is just a starting point. 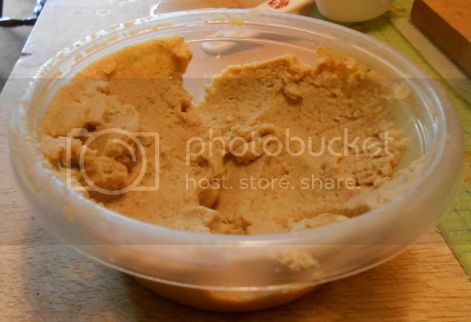 That’s where this hummus differs. Instead of two, it features five–count ’em, five–whole garlic cloves. And that’s not all. I discovered a while back that pressing the garlic before adding it to the hummus instead of tossing whole cloves in the food processor makes for a more pronounced garlic flavor. Pressing the garlic is essential to this recipe! If you don’t have a garlic press, you’ll still get tasty hummus; it just won’t pack as big a punch. Joining the garlic here are two spicy extras: a jalapeno pepper and some chili powder. I like chili powder as much as I like garlic, so I tend to use a lot of it. For those of you who prefer a milder spicy flavor, I’ve put a pretty big range of potential spice in the recipe. Start off with 1tsp and work your way up to where you like it for maximum hummus enjoyment. Oh, and I did I mention that, unlike the original recipe, this one contains absolutely no oil? Trust me, you can’t even tell. A spicy, garlicky hummus perfect for dipping, spreading on sandwiches or just eating out of the container. Adapted from The 30-Minute Vegan. Place the chickpeas in a food processor and pulse a few times until there are no whole chickpeas left. Avoid making a paste; you just want to chop them up a bit. Add the remaining ingredients, starting with the lowest amounts of lemon juice and chili powder, and process until smooth and creamy. Taste and adjust seasonings, adding water as necessary to achieve the desired consistency. Blend again as needed. Store in an airtight container in the refrigerator. Feel free to smear this on sandwiches, dip veggies in it or smush a big pile of it on salad. Or spend a little time licking it off the spatula after you’ve cleaned out the food processor. I won’t judge.